I have meandered along this path, not altogether blindly, but with only a vague destination, no route map or compass, a very small support crew (my husband) and many passages up dead-ends, steep cliffs, never-ending, unremittingly straight roads, in earshot of the happening parties just out of sight over the next crest. Thankfully, along the lonely way, people have happened along to say 'hi', including Annette, from A French Collection (above). 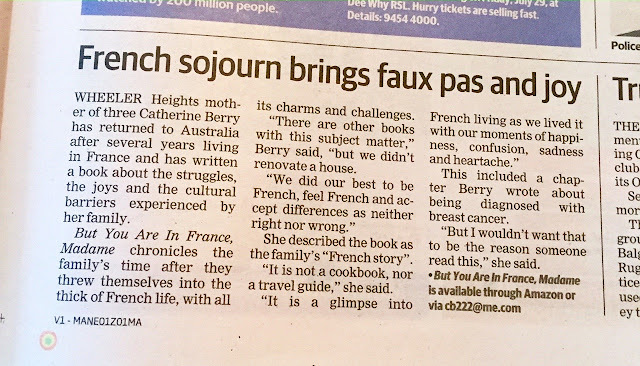 Both Australian, we connected through my book and her website, discovered that we live only 170 kms apart (not far in Australian terms), have three children each of roughly the same ages and share a somewhat inexplicable attachment to France. We met up for the first time last week and, after a simple lunch, we sat and chatted in front of the camera. If you are curious, you only need click on the link here, or above, to find out more. 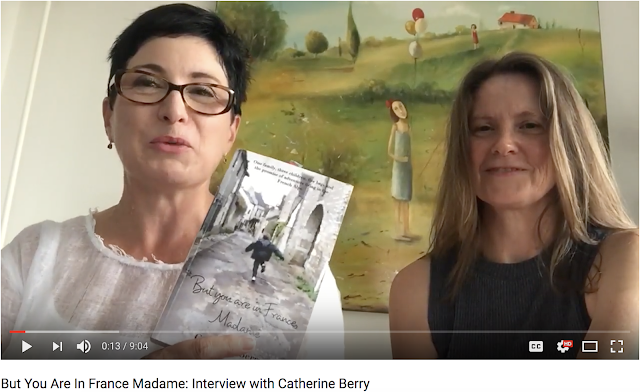 As always, copies of 'But you are in France, Madame', which take you with us on our French adventure are easily downloadable at Amazon, here or send me an email on cb222@me.com if you'd prefer a print copy. Lastly, let me say a sincere thank-you to everyone who has been a part of this publishing journey to date; your encouragements and heart-warming appearances at the sidelines have kept me going and have motivated me to see how far we can go. ... is to expect nothing in return. Self-preservation dictates this. I used to send out letters and emails, and leave phone messages and suggested contact times, and then happily await responses. Not so, these days. I am inordinately joyous if an editor replies with a negative, as long as it is still positive. My most scathing reply to a submitted article was along the lines of ‘we only accept well-researched pieces, not short, bitty ones’. OK, no beating around the bush, even though it did take me a couple of prods to get those few words. Honestly, was the submitted article worthy of such ‘ouch’? Probably. At least, I got something back. But, I’d still be curious to work out how one can be on the job pile one day and dish out such delicacies the next. What is the timeframe for editors and publishers to go from being generous, humble and supportive to condescending and indifferent? I’d come across this attitude previously, in circles other than publishing. 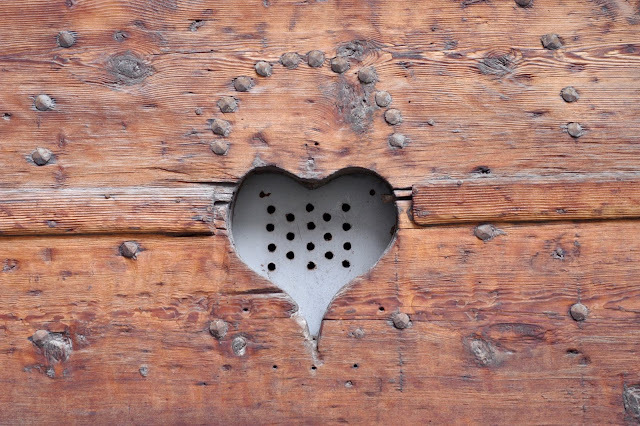 My medical specialists’ secretaries have always been particularly good at giving me the brush off, defending at all costs their partner-by-association superiors and unaware of how much more important kindness and compassion are following unsettling consultations. Living in France, I learnt that it was easier to start something expecting a ‘no’. Before attempting to do anything administrative, I’d mentally rehearse all that needed to be said; prepare and sort all the documentation that I figured would need presenting; take a few extra bits of paper for good luck; expect a long wait to be seen and subsequent parking fine; and practice simultaneously clenching and rolling my tongue between my teeth in an attempt to stop the tears that would start to spurt when being told that what I had come to do would not be possible. Fortunately, there are still some kind-hearted, generous people out there: Amongst others…established authors (#patricialsands) who started following me on Goodreads when there was not much to follow; fellow Instagrammers and bloggers (#eatlivtravwrite) who chose to buy and review my book despite being sent postboxes full of free ones to review each week; interviewers (#thebookpodcast) who feature known, prize-winning authors…and me; store owners (#frenchcargo, #languagebookcentre) who not only stock my book but promote it enthusiastically; blogger/authors (French word-a-day and An Accidental blog) who listed my book on their sites and did not ask for anything in return and everyone who has purchased our family story 'But you are in France, Madame'. To all of you, 'thank-you'. ...and, if you haven't already purchased my ebook and would like to do so, it would be lovely if you used the link in Mardi Michels article, as it is part of the Amazon affiliate program...just a small way of showing your (and my) appreciation - and it costs you no more. If you would prefer a print copy, then another affiliate link is to be found in Kristin Espinasse's French word-a-day blog. Again, a purchase here would be so very much appreciated by us both. Merci beaucoup.